Diaphragm metering pump is a type of metering pump which is used to move a precise volume of fluid (water or liquid chemical) in a particular time period over an exact flow rate during the process. Metering refers to the transportation of precise volume of fluid. In case of dangerous fluid, toxic or noxious fluid, diaphragm pumps are used for metering to avoid leakage at the seal or packaging. Diaphragm metering pump contains a diaphragm (a thin sheet of material forming partition) which does not let fluid penetrate it through and offers leakage free operation. Diaphragm metering pumps are mainly used in chemical industries and oil & petroleum industries. Global diaphragm metering pump market is expected to witness a robust growth over the forecast period 2017-2024. Expansion of industries such as chemical and oil & petroleum and adoption of effective & safe machineries in such industries are anticipated to foster the growth of global diaphragm metering pump market over the forecast period. 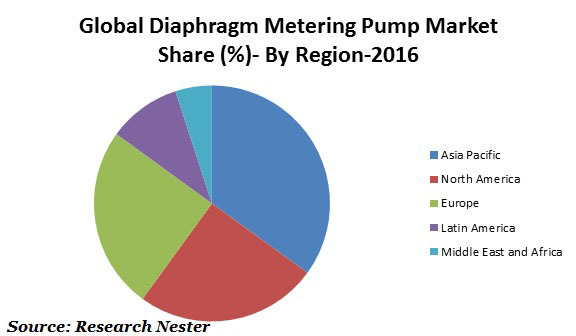 Geographically, the global diaphragm metering pump market is segmented in five major regions: North America, Europe, Asia Pacific, Latin America and Middle East & Africa region. Diaphragm metering pumps are used in different industrial sectors such as in oil & gas, petroleum and chemical industries and others. In such industries, numerous chemicals, toxic and other additives are used to prevent corrosion and deposits in the pipes, to improve flow characteristics and for smooth operations. These additives are very dangerous and must not be allowed to come in contact with each other. High adoption of diaphragm pump on the account of above mentioned factors is driving the growth of global diaphragm metering pump market. Modification of existing industries or development of new industries such as oil & petroleum and chemical industries in emerging economics are some of the major factors driving the growth of global diaphragm market. Additionally, rising use of diaphragm metering pump in cosmetic industries is a major growth driver which is likely to foster the growth of global diaphragm metering pump market. Increasing demand for safe drinking water and use of diaphragm metering pump in water treatment industries are one of the major drivers of global diaphragm metering pump market. This factor is expected to propel the demand for diaphragm metering pump in near future. However, high price of diaphragm metering pump is hampering the growth of diaphragm metering pump market. Apart from this, the rising price wars among major players are restricting the innovation and technological development. This factor is anticipated to inhibit the growth of global diaphragm metering pump market.